The American military began thinking about self propelled artillery once more in the second half of the 1930s. This pause is largely connected with the desire to avoid past mistakes and refrain from designing on SPG on a chassis that was not yet in mass production. After a long period of searching and backroom dealing, the US Army finally obtained mass production tanks. The infantry was armed with the Light Tank M2 and the cavalry with the Combat Car M1. 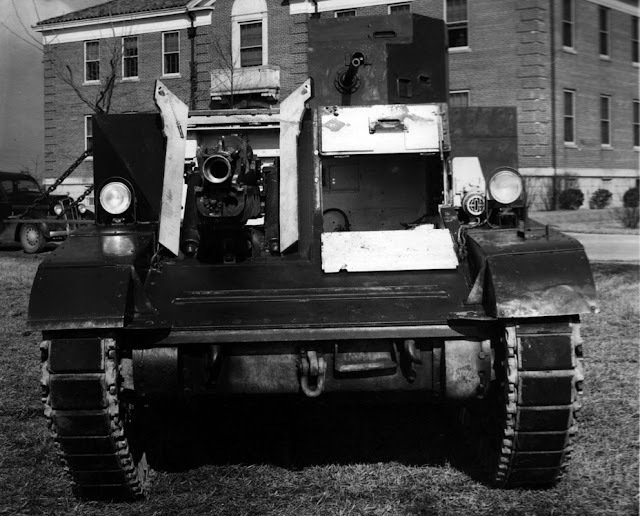 These quick vehicles armed with machineguns became a symbol of the American re-armament in the late 1930s. The idea of building an SPG on a light tank chassis was obvious.The armament of American light tanks, consisting of only one high caliber machinegun and two or three rifle caliber machineguns, seriously limited their usefulness in battle. The lack of cannons was caused by the fact that the American 37 mm short barreled tank gun was inferior in penetration to the 12.7 mm Browning M2. The development of a more powerful gun in the early 1930s hit a dead end, so the Americans had no other choice. There was still a need for a fighting machine armed with something more serious than a machinegun. The same vehicle at Fort Bragg, North Carolina, where it went through the first round of gunnery trials. The first attempt to build a light SPG used the Light Tank M2A1 as the chassis. Designed in 1936, it received a 47 mm cannon. The attempt was unsuccessful, as the low penetration of the weapon made the attempt pointless. The cavalry also wanted their own SPG. On July 27th, 1938, a meeting was held at the HQ of the 7th Cavalry Brigade in Fort Knox, the center of mechanization of American cavalry. The concept of a tank support vehicle was discussed at the meeting. Its armament would consist of a 75 mm Pack Howitzer, the same gun used on the HMC T1. The SPG would ride along with the tanks and destroy targets at close range. As expected, the Combat Car M1 would serve as the chassis. 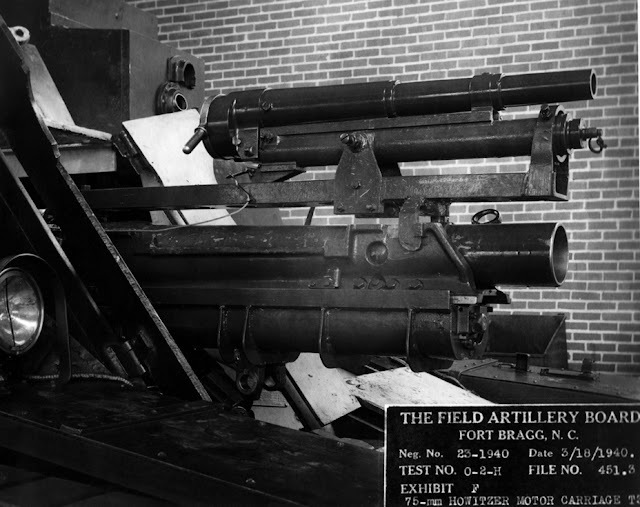 A 37 mm gun was mounted on top of the howitzer for some trials. The Technical Ordnance Committee met on March 9th, 1939, and approved the construction of a prototype SPG. 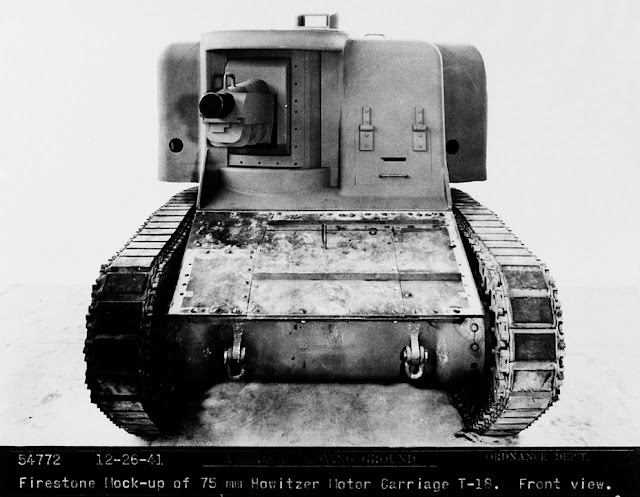 The vehicle was indexed Howitzer Motor Carriage T3. It was not build from scratch: Combat Car M1 number 54, U.S.A. W.40153, became the chassis donor. This allowed the unification of the SPG with the tanks it was going to support, as well as simplified production. The HMC T3 was ready for trials in January of 1940. The mass of the SPG grew to 9072 kg. The base chassis was almost unchanged compared to the Combat Car M1. Most changes were made in the fighting compartment and driver's compartment. The tank lost its turret, but the commander was given the small turret from the Light Tank M2A3. The height of the fighting compartment was increased to give it more volume. Despite all these changes, the HMC T3 only had enough room for three crewmen. Most of the space was taken up by the M1A1 75 mm howitzer and its railing. Only two men could fit into the prototype that was actually built in metal. However, there was enough room for 61 shells and 3600 rounds. The howitzer, mounted in the right half of the fighting compartment, was aimed by the driver and loaded by the commander. The regular howitzer sight was used to aim it. The result was, in a way, the inverse of the French Char B concept: quick, but with no armour. The large hatch on the side gave the HMC T3 a resemblance to a secretaire desk. The one thing that the HMC T3 had no shortage of was hatches. This had to do with the fact that a large amount of gases built up in the cramped fighting compartment, and ventilation had to be supplied somehow. 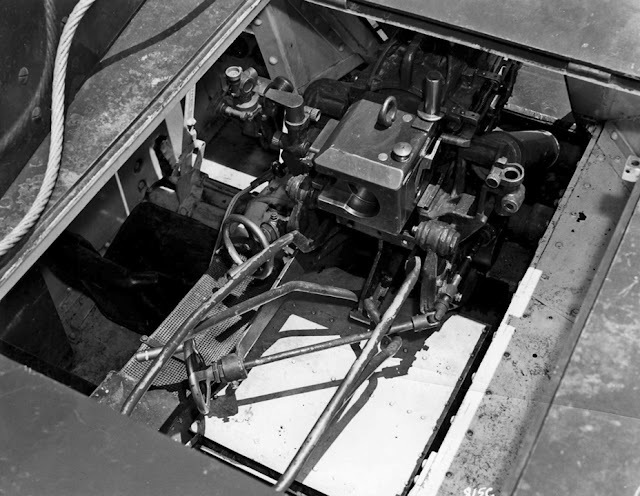 A large two piece hatch was installed above the howitzer, another hatch that flipped down and was held on by chains was put into the right side. It made the vehicle look like a secretaire desk on tracks. This was not enough for the creators of the HMC T3. In its normal position, the howitzer could not be aimed without turning the entire vehicle. For this reason, the front of the hull had a two-piece hatch that let the howitzer turn 10 degrees to the left and 15 degrees to the right when opened. However, this opened up a huge hole in the front plate, which was very inviting to bullets and shrapnel. Trials at the Aberdeen Proving Grounds began in late January of 1940. The vehicle accelerated up to 72 kph, with mobility at the level of the Combat Car T1. However, while speed was an important factor, it was far from the most important. The HMC T3 was sent to Fort Bragg, the home of the Department of Field Artillery, on February 13th. The study and trials of the vehicle went on until March 11th. The artillerymen attached a 37 mm M1916 infantry gun to the top of the howitzer to evaluate the ability of the driver/gunner to aim the weapon. The vehicle was found unsatisfactory, to put it mildly. The gun and its railings took up too much space. It was also hard to aim the howitzer, but the vehicle itself mad an excellent target, as it could not fire on the move. Firing at moving targets also went poorly. The targets could be hit, but 27 seconds passed between a target being sighted and the first shot fired. During initial trials, 11 shots hit the target out of 16. On the second try, only 2 out of 14 shots hit. Attempts to fire on the move did not result in positive results. 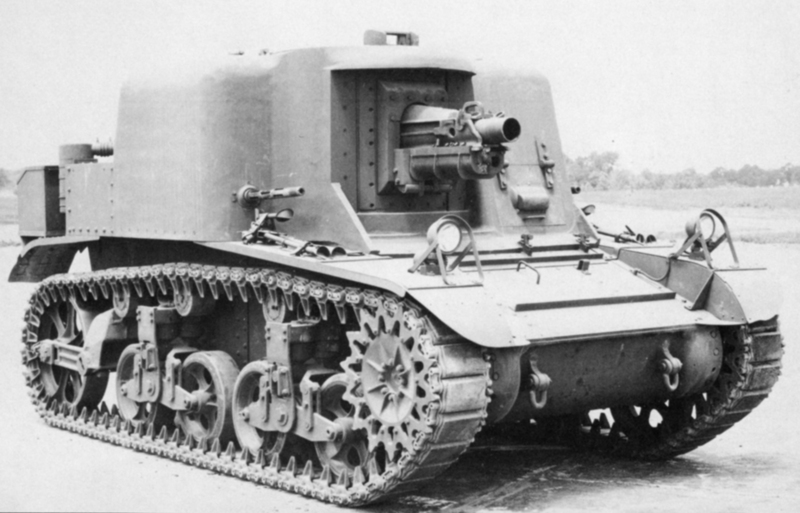 The SPG was nicknamed "Griffith" during trials in 1940. The overall verdict was as follows: The Howitzer Motor Carriage T3 is unsuitable for use in a support role in mechanized units. The Department of Field Artillery composed its own vision of a suitable vehicle. According to the artillerymen, the SPG would weigh 11.5 short tons (10.43 metric tons), but its mobility had to keep up with cavalry tanks. The crew of the vehicle would number 4, ideally 5, crewmen. The commander and the driver had to perform only one role. The front armour had to protect it from 37 mm guns. The 75 mm howitzer was satisfactory, but its recoil length had to be shortened to 30 cm and rate of fire increased to 10 RPM. The right side of the HMC T3 contained only air. Lots and lots of air, as the long recoil and sizeable railing left no room for crew here. The HMC T3 went back to Fort Knox with this harsh evaluation, where it arrived on March 18th, 1940. The vehicle needed repairs after trials at Fort Bragg, which were performed during April. In addition to everything else, the engine had to be swapped out. Mobility trials followed, during which the vehicle traveled 1274 km. In May, the SPG participated in maneuvers of the 3rd Army in Louisiana, where it traveled 1077 km. The vehicle received the name "Griffith" around this time. In the summer, the SPG participated in more gunnery trials. Overall, the mobility of the Combat Car M1 was retained, although it took longer to speed up. The increase in mass also impacted maneuverability. The location of the howitzer on the right side shifted the center of mass. As for the gun itself, the cavalry made the same conclusions as the artillerymen at Fort Bragg. The vehicle was too cramped and uncomfortable. The hatch that allowed the gun to be aimed horizontally could only be opened from the outside. The placement of the ammunition was poor. On trials, the crew could only fire three shots in 50 seconds. This photo demonstrates how comfortable it was to work in the HMC T3. It was easier for the commander, not the driver, to aim the gun. The commander served as the loader and turret gunner as well. The cavalry also deemed the HMC T3 as unsuitable in a support role. 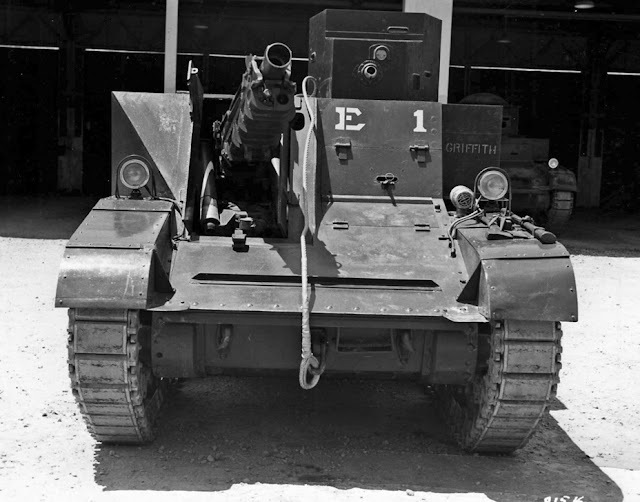 The Combat Car M1 chassis was too small for an SPG. It was much more reasonable to build an SPG on the chassis of a medium tank. This proposal was made with the Medium Tank T5E2 in mind, which had the same armament. The creation of a 75 mm SPG was still the priority, but the military's appetites grew, In the verdict on the HMC T3, the desire for a 105 mm howitzer is stated. After bad luck with the HMC T3, work on a light support SPG stopped for about a year. In that year, the American armoured forces changed considerably. The separation between infantry and cavalry tanks was erased, and the Combat Car M1 became the Light Tank M1A2. The improved Light Tank M2A4 replaced the machinegun armed M2A2 and M2A3. Machinegun tanks gave way to tanks armed with cannons and thicker armour. However, even the Light Tank M2A4 did not stay in production for long. Production of the Light Tank M3, destined to become the most numerous light tank in the American army when it joined WWII, began in March of 1941. The Americans returned to the idea of building a light SPG in June of 1941. The requirements were largely the same as those formed by the Department of Field Artillery in March of 1940. The only addition was the desire to install a 105 mm howitzer, if possible. However, after studying the Light Tank M3, it became clear that 105 mm is too big for the chassis. There was no alternative to the 75 mm Pack Howitzer M1A1 with such a small fighting compartment. Even thought the Light Tank M3 was supposed to be the chassis for the new SPG, the first project, titled Howitzer Motor Carriage T17, used a different chassis. The cavalry, who considered its tanks more suitable, got involved. The experimental Combat Car M1E3 served as the chassis for the HMC T17. In addition to a new suspension with a rubber-metallic track, the driveshaft leading from the engine to the gearbox was lowered by 16.5 cm. This noticeably improved the crew conditions. However, the lower driveshaft was the only advantage of the Combat Car M1E3. 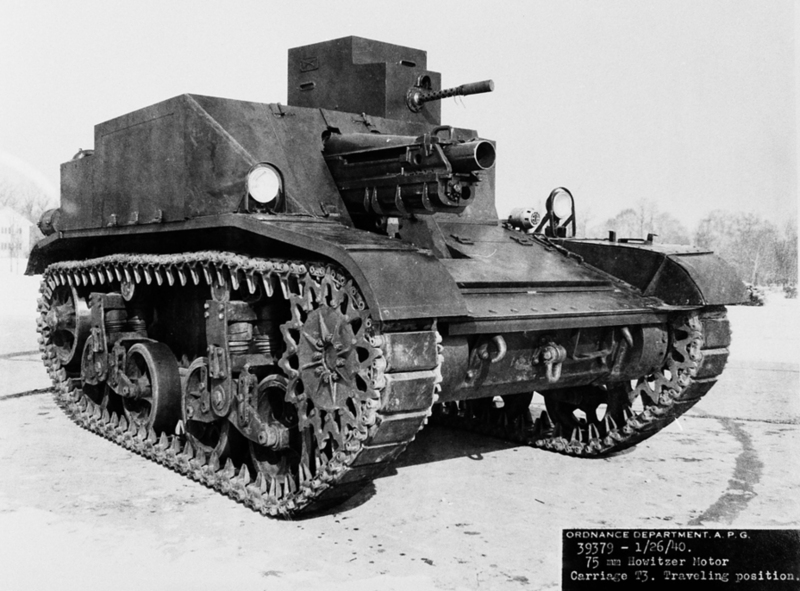 The Light Tank M3 was superior in all other ways, and, more importantly, it was already in production. It's not surprising that work on the HMC T17 ended at the draft stage. The photo shows that initially there was only one hatch in the roof of the fighting compartment. The Howitzer Motor Carriage T18 project was much more promising. 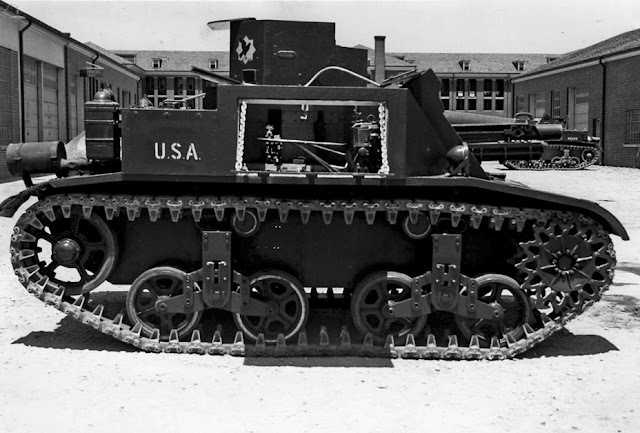 It was designed on the Light Tank M3 chassis and was much more aligned with the requirements of the American military, especially when it came to protection. In October of 1941, the Ordnance Committee approved the production of a wooden model of the HMC T18, and, after its approval, two prototypes from mild steel. The project was given to the Firestone Tire and Rubber Company. The choice of a tire manufacturer might seem strange if one does not know about Firestone's other operations. Much like Goodyear, another tire giant, Firestone worked on building blimps. 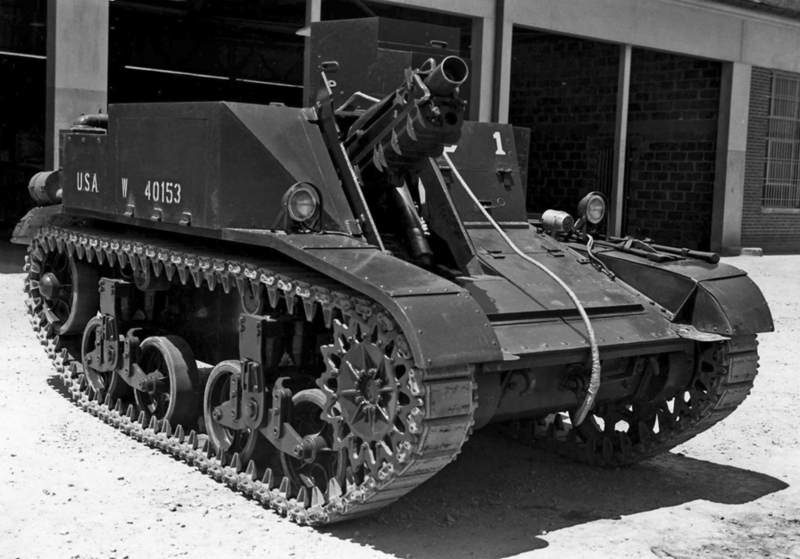 In addition, it produced rubber-metallic track links for tanks, ammunition, gas masks, and many other things. The contract was no accident. Firestone was not only the builder, but also the developer of the T18. The full sized model of the HMC T18 was presented on December 26th, 1941. As with the HCM T3, the chassis remained unchanged. Overall, the layout of the HCM T3 did not change significantly: the 75 mm Pack Howitzer M1A1 was also put in the front of the casemate, shifted to the right. At the same time, some mistakes were corrected. 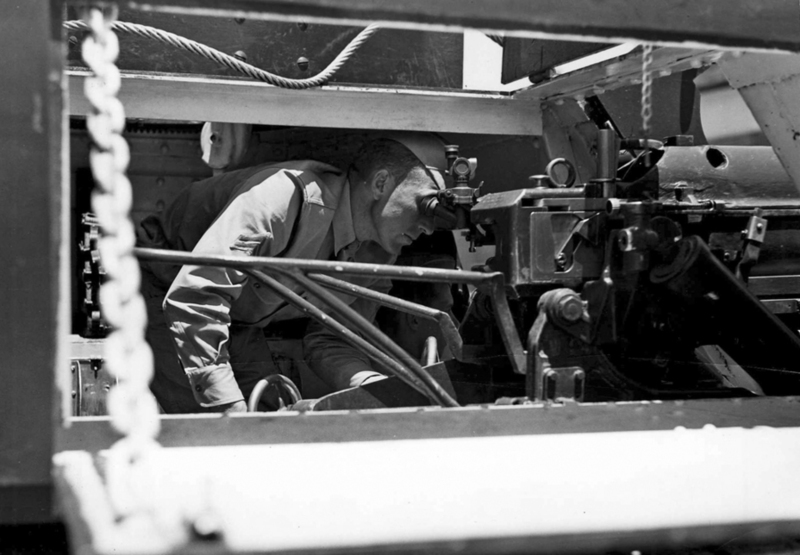 The small fighting compartment could not fit four men, but a loader was introduced. 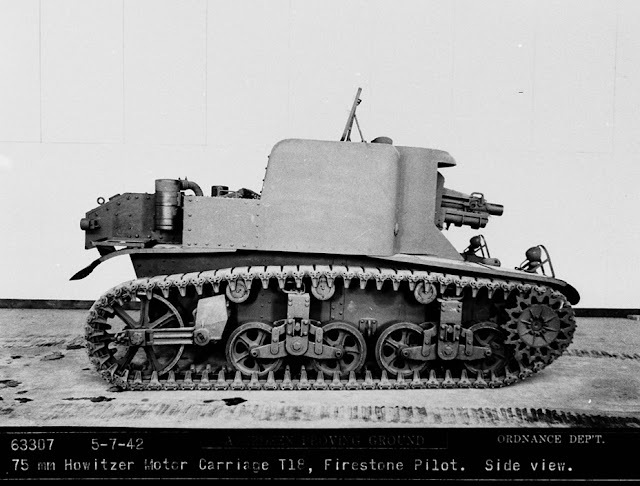 The Firestone engineers did not reinvent the wheel and took the M1 gun mount from the Medium Tank M3, replacing the 75 mm M2 gun with a howitzer of the same caliber. This resolved all issues with protection of the gun and sights. After inspection at the Aberdeen Proving Grounds, some changes were made to the vehicle. 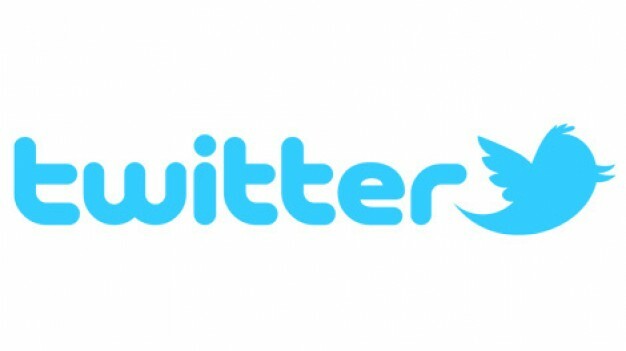 The commission demanded that the number of hatches in the roof be increased to two. The driver's hatch was also modified, and some elements inside the SPG were moved around. This was connected with the fact that the two machineguns in sponsons, like on the Light Tank M2A4 and M3, deleted. They were also present on the full size model of the HMC T18. You can see that the vehicle is slightly tilted. This is caused by overloading of the front of the SPG. The experimental HMC T18 ended up at the Aberdeen Proving Grounds on May 7th, 1942. Most of the issues pointed out by the model commission were resolved. The number of hatches in the roof was increased to two, as required. The hatches received special stoppers. In addition to their primary function, they also helped with ventilation of the fighting compartment. Another important requirement, the protection of the SPG from 37 mm gun fire, was also satisfied. The cast casemate had 51 mm of armour in the front and 32 mm along the sides. The mass of the HCM T18 grew to 13.5 tons. When looking from the side, the vehicle tilts forward because of this. The ammunition capacity was also cut by a third: the small fighting compartment could only fit 42 rounds. The top speed of the SPG was 56 kph; the mobility remained the same as on its base tank. As the model commission demanded, the number of roof hatches was increased to two. The issue was that the vehicle's fate was sealed a whole month before it reached trials. 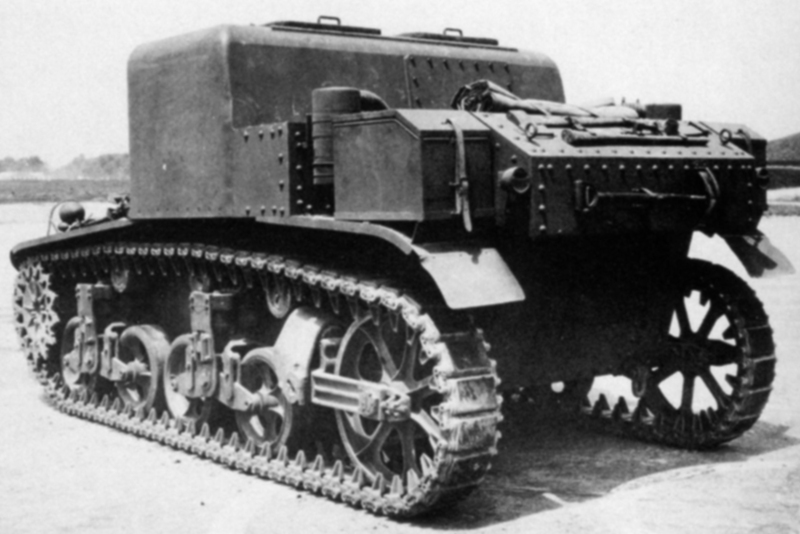 In November of 1941, a new light tank was already planned for production. Its biggest changes were the use of two Cadillac engines and an improved hull. After trials, the vehicle was accepted into service as the Light Tank M4, renamed to Light Tank M5 in February of 1942. 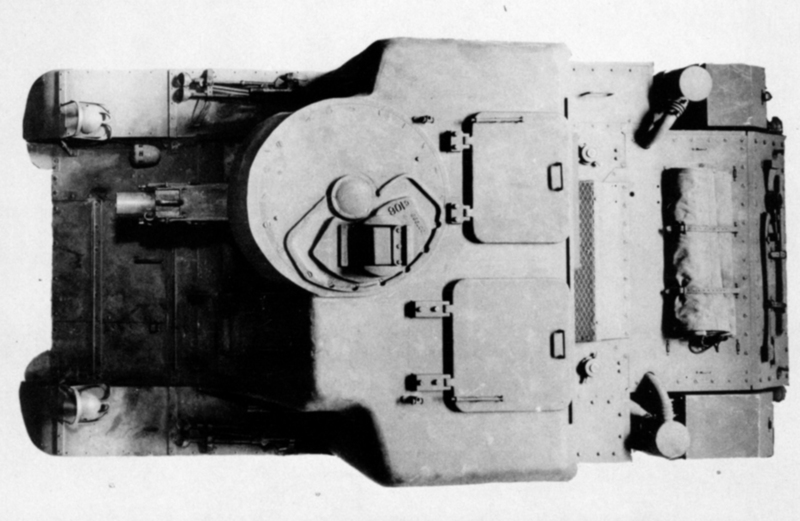 A better hull design and sloped front armour increased the size of the fighting compartment. It's not surprising that Firestone was tasked with reworking their SPG to fit the new chassis in December of 1941. Full sized models of the HMC T41 and T47 SPGs were presented in April of 1942. The T42, which managed to fit the howitzer into a turret, was the most suitable for the task of supporting tanks. Because of this, a decision was made in April of 1942 to cancel the HCM T18 program. A hatch in the rear of the casemate was used for removing the howitzer. In this case, the American military turned out to be right. 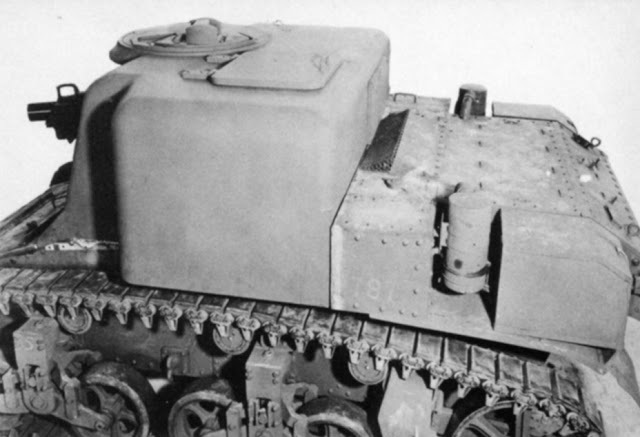 The relatively thick armour of the HCM T18 was already vulnerable for enemy tank and anti-tank guns. The cramped fighting compartment made the crew's lives difficult. The T18 also had poor visibility. The replacement of the immobile casemate with an open topped turret solved the issue of ventilation, visibility, and mobility of fire. The 20+ year service life of the HMC T47, which turned into the HMC M8, speaks for itself. After the cancellation of the HCM T18, the 75 mm Pack Howitzer M1A1 was installed on the M3 halftrack, creating the HCM T30. The T30 first saw combat in November of 1942. Created as a temporary solution, the HCM T30 fought for several years in Africa and Italy.